Dive into our Swim Meets! You are here: Home / SwimWest updates / Dive into our Swim Meets! 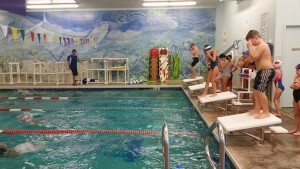 Swim meets bring in the competitive aspect into swimming. SwimWest makes it a fun introduction to what swimming competitions are by encouraging the swimmers, showing them a team effort, and making them smile the entire time. Your child’s first experience will be a positive one. Here are all your need-to-knows about our swim meets! All of our meets are on a Saturday starting at 1pm. Swimmers should arrive approximately a half hour early to check-in at the front desk, get changed, and begin warm-ups which begin promptly at 12:40pm. Make sure you bring a water bottle, towel to have on deck, an extra pair of googles incase a pair breaks, an extra towel for after the meet, and an extra swim cap. There will be plenty of heat sheets posted all over the building, especially in the observation area. The coaches can help you figure out what events your swimmer will be in and when they occur. Males are even event numbers and females are odd event numbers. If helpful, you can write the event on your swimmer’s hand, or arm to help them remember which event they are in. Once your swimmer is ready, have them find either Coach Nikki, or Coach Kyle on the pool deck. They will let them know when it is time to line up for the race. Coach Jon will announce the events and help swimmers get started properly. And of course, swimmers will receive ribbons for each of their races! There is only room for 65 swimmers so sign up for the next meet on-line by clicking the button bellow or by calling us at (608) 831-6829. See you there!